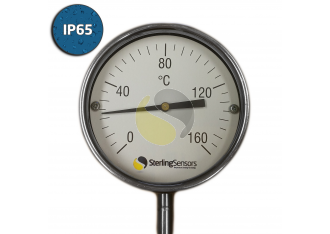 This range of robust, direct mounting dial thermometers are manufactured to meet the requirements of industrial temperature measurement for fluids or gases. Available with temperature measurement ranges from -20 to 600 °C with Class 1.0 accuracy (1% of FSD). The 100mm (4”) diameter dial gauge is Nitrogen gas actuated with a case and bezel made from stainless steel. It has a 12.7mm (1/2") diameter plain rigid stem, available in lengths of 150, 300 or 500mm as standard and vertical bottom entry, for use with compression fittings for easy process connection. Call or email us to ask about the many options available in this range; including longer stem lengths, remote reading, dial sizes, glycerine filling or to discuss a product to suit your application needs.